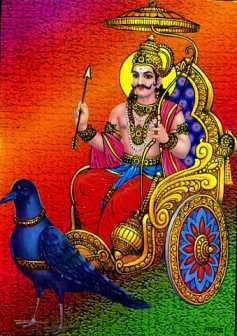 Lord Shani or Sani is one of the Navagrahas or the nine celestial planets in Hindu astrology. Shani Dev or Planet Saturn is the Lord of Saturday and is embodied in the planet Saturn. Saneeshwara is called so as it moves slowly and takes about 30 years to revolve around the sun. Shani is also known as Chayyaputra as he is the son of Lord Surya, the Sun God and his wife Chhaya. Yama, the God of death is his elder brother. A person’s life is rewarded or punished appropriately during his lifetime according to his present and past deeds. Shani is known as a great teacher and the impact of Shani is so much that when Shani opened his eyes for the first time while he was a baby the sun went into an eclipse. Shani punishes those who follow the path of evil hence he is considered as the trouble giver as well as the well wisher. Shani is dark in color, wearing black clothes, holding a sword, arrows and two daggers and mounted on a vulture. Vulture is Shani’s vahana. As protector of property, Shani is able to suppress the thieving tendencies of these birds. Lord Saneeshwara is more known for his blessings that his ill effects. A favorably placed Shani in the horoscope of a person stands for a strong career, healthy life and prosperity. Shani can also award one with leadership qualities along with fame and recognition among the masses. Lord Saneeshwara is known as Needhiman or judge as he always blesses those who are righteous and devoted. Shani if unfavorably placed in a person’s horoscope is known as Shani Dosha and it denotes trouble in all ways. Shani is feared by those Hindus who believe in astrology as the effects of Shani being unfavorable can be very severe. Shani brings about the bad effects of one’s deed or karma and the diseases which Shani curses at physical level are poor blood supply, asthma, impotency, and tuberculosis (TB), and at mental level are narrow mind, low esteem among others and so on. Shani tests person’s patience and frustrations and delays.